I suddenly struck me that the 9 of April was a day of significant loss and shame for my country Denmark. We and Norway were occupied by the German Nazi regime on that date 75 years ago. The Germans had rearmed for years without anybody interfering, and our government had disarmed our military to such a degree, that we couldn’t defend ourselves. We lost 16 soldiers in that morning in an utterly hopeless and uneven fight. A new film has been made to honour the fallen soldiers from that date. See the link here to see it if you would: 9 April. Slowly mostly young people from about nineteen to thirty years old found ways to organise themselves in resistance groups and cooperation was created between them and the British SOE (Special Operation Executive) a secret service under Winston Churchill. Older people participated too of course. All over Denmark, you will be able to see the graves of many RAF pilots and airmen on the Churchyards. Everything is kept beautifully to this day. (There are an App “Airmen.DK” where all the war graves can be found.) 300 aeroplanes crashed over Denmark, and we have about 1200 graves. Most sabotage had the aim of stopping German troop transports to and from Norway and to destroy firms that cooperated with the German oppressors. In October 1943 the Danish resistance movement stood behind the quick action to save all our Jewish population of 7000 people from deportation to KZ camps. Unfortunately not all made it safe over to Sweden or were not able to react promptly to the sudden danger. 481 were found and sent to KZ camp Theresienstadt and 52 out of them died. 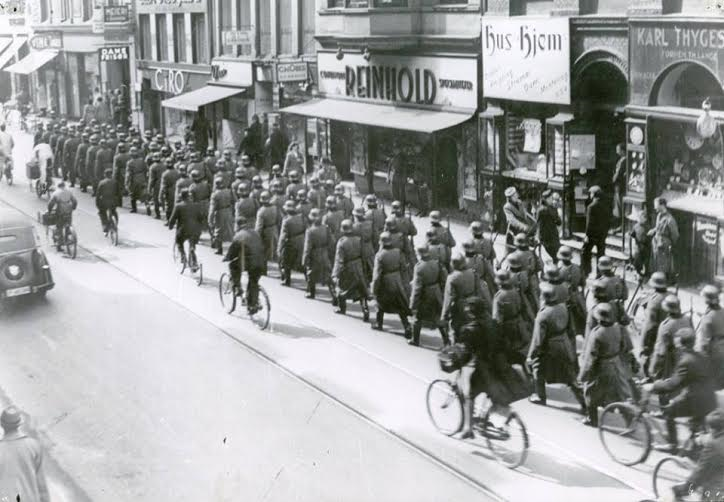 “A cold-shoulder,” The Danes thought that the German soldiers just stole our goods from the shops. In spring 1945 the Gestapo had found the names of nearly all the Danish resistance people and action was needed to bomb the Gestapo headquarters in Copenhagen in the Schell House. (Schellhuset). They had the archives on the resistance there, and the arrested people were put there as hostages would soon be executed and the rest would be rounded up. The SOE was asked to bomb the Gestapo Headquarters, and the operation was called “Carthage”. A WordPress blog can be read about it in the link. In the 70 anniversary of the bombings, Simon Bang and Martin Sundstrøm have made a documentary film about this aspect of bombing the archives and freeing the resistance people at the same time killing the many innocent children and teachers by accident. The film is called “The Attack on the Shell house” it’s partly in Danish, but the interviews with the surviving pilots are of course in English. There is a Facebook page on the same film. On the 21. of March 1945 20 Mosquitos and 30 Mustang air crafts from the RAF came in three waves flying very low,15 meters, and in awful weather. Six planes were lost and 9 airmen. 125 Danish civilian lives were lost included 86 school children. One of the air crafts had hit a light pole and had crashed and created a big fire. Some of those that followed in the next wave thought that it was the target and placed all their bombs there. It happened to be a Catholic French School called the Jeanne d´Arc School. Some of the children from the school have had lifelong traumas as they were told never to mention what had happened. They had seen their friends and siblings drown in the water under the cellar or buried under the rubble. Those who hit the right target at Schellhuset managed to hit the lower part of the house so that 18 Danish prisoners placed under the roof somehow got out. Eight were killed together with a lot of Germans. If all the bombs had hit the right place the prisoners would never have managed to escape. The Germans would send the found resistance people to KZ camps or execute them at once. A big general strike arouses because of the executing. The Gestapo changed tactics to exert terror murders, the so-called “Clearing murders” that hit innocent people as soon as a resistance group had made an action. Physicians, authors and people from newspapers were shut. The resistance people were still sent to the KZ camps. Also, popular buildings were bombed by the Germans as reprisals. The date the 9. of April 1940 was burnt into our conscience as a day of shame where we just let the enemy in without hardly any resistance. It was a great loss as we have never really got over it. The politicians from that time regained power after the war and they were able to convey the opinion that it was good that Denmark was not destroyed during the war due to their cooperation with the Wehrmacht who had occupied us. Our country was not as damaged as many other countries involved in the WWII as the Germans mostly wanted to use our food production and let their soldiers recreate from the battles at the different fronts. I am glad that many of the young generations weren’t afraid of losing their lives for the sake of our freedom and because of their actions we were accepted on the side of the Allied countries on the day of our liberation on the 5 of May 1945. I am not sure that our politicians the government today will make a priority of being able to defend ourselves against new intruders. Very interesting. WWII is a subject that I am deeply interested in so I read all that I can about it. Well done. Thank you @dia for your encouragement. I read very much my self about that time. I want to know how people survived and coped with great danger. I love your writing! I have never read or heard a Danish account before (of WWII). Thank you for sharing and educating me. I cannot wait to read you next in this series! Thank you for sharing this information about Danish occupation in ww2, of which I knew nothing about. Maria, this is a story that needs to be told. The people within these resistance groups really were quite incredible, and the risk was high. The war continued on for Australia until 15th August 1945, against the Japanese Imperial Army. It ended on my Grandmothers birthday. Though, she had nothing to be happy about. Her beloved fiancé was killed as the war plane he was in, crashed into a mountain over Scotland, killing the 5 men aboard in 1941. I imagine, she felt numb to everything after this. I am doing quite a lot of research on the subject, and writing a book about my Grandmother and her life. This is my long-term project. Meanwhile I am at the other end of the spectrum, writing and self-publishing my first picture book. I was really ‘stuck’ on this loss assignment, but I have just realised the loss I now feel. I never knew the young man she lost, and I wish I had. He may have been my Grandfather. @Lyndal maybe you could put together your grandmother’s story and share it with us.